I’m a sucker for those movies where sweet, innocent kids remind jaded, unsentimental grown ups how hope and goodwill are really what life is all about. If the jaded grown up is Sam Elliott, I get a little faint. Then if the movie is about Christmas, I’ll collapse. Watching Sam Elliott as her cheerless widowed father struggle with grief and frustration is heartbreaking, and awesome because he does a fair amount of it in long underwear. But slowly he sees his daughter’s unwavering faith in the season win over the people around her, some of who were almost as crabby as him. 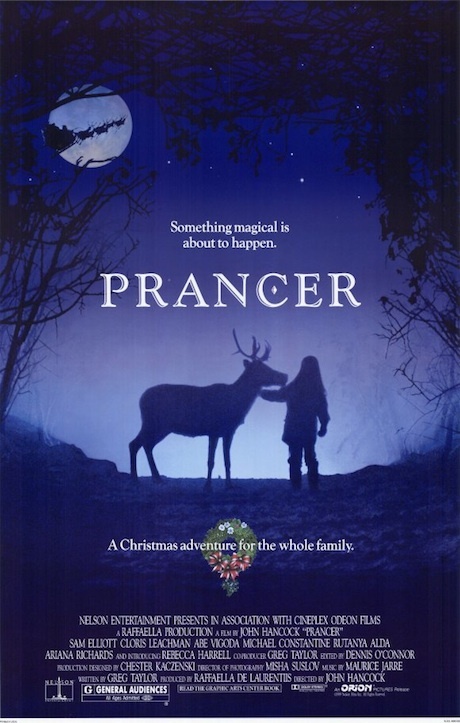 Then he understands that saving Prancer really will do everything she believes it will do – SAVE CHRISTMAS. Which of course it does, along with everything and everyone. And then we all cry and cry and cry because it’s so sweet! Caroline Nelson lives with her husband and son in a place much like Lake Wobegon. She is a life-long film lover and a best friend to the Wagner sister. 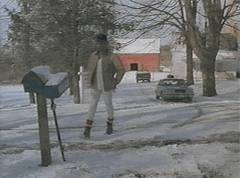 I haven’t seen Prancer however you know how to sell a movie: Sam Elliott in long underwear! Why haven’t I seen this movie?! Remember watching the movie Lifeguard and thinking it was the best ever? I watched it again this week-end and then wanted to add a few pages to my paltry little post . . . it’s such a great movie! JUST LIKE Lifeguard only with reindeer and long underwear and you’ll cry during it. Abe vigoda is in it, too! LIKE Lifeguard only with reindeer – can this be the new title?